28.5'' in height, 13'' to 12.5'' in width, and 9.5'' to 9'' in depth. 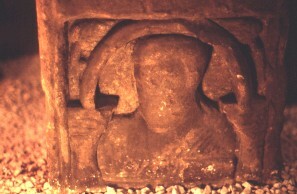 This piece of the shaft has three busts of figures, thought to be Apostles. The three figures are holding books, and are not haloed. The figures are set under rounded arches with capitals. The lower figure is seen here.